Ok. Here’s the thing. Whenever I come home (aka to the parents’ house), the first thing I do is look in the fridge. Then I go to the pantry. 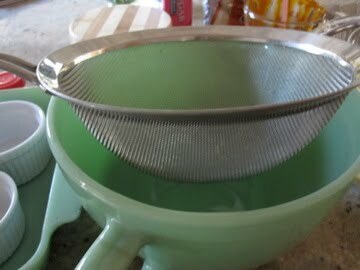 I have a meal sitting down at the table and immediately after I have a second meal standing up, hovering over all of the exciting goodies and treats, snacking, sticking my fingers into this and that, taking a nibble here and there, munching, crunching, and pigging out. I’m telling you, my manners have flown the coop. I eat a bowl of cereal and lick it clean, getting dribbles of milk and soggy flakes all over my chin. And yep, you betcha, I LOOOOOVE soggy cereal. No matter what kind, the soggier the better. Chocolate covered peanut butter filled pretzels. Need I say more? 5 different flavors of ice cream …of course I must taste every single one. One of my favorite drawers in the house is the “gum drawer,” and gum is not the only star of this drawer: we’re talking gum, lollipops, little candies, good quality dark chocolate, even birthday candles and chalk (yah, the kind you write on a chalk board with). Then comes part 2, the stomach ache. Ouch. I ate waaaaay too much. But it was just sooo good. Indeed when I come home, my family looks forward to my “gourmet” home cooking. I have to impress, and I always do (well, I try). 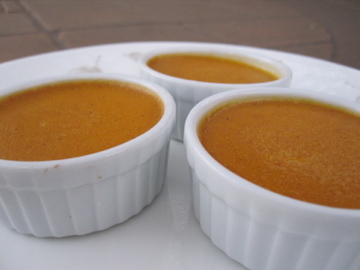 This time, I whipped up these cute little pumpkin custards. Baked in ramekins both tiny and a bit larger than tiny, these little custards are just so darn good. Good for dessert, but in my opinion, even better for breakfast, spread on toast or waffles (really yummy with leftover Thanksgiving cranberry sauce), as a filling for Ebelskiver pancakes, and yes, I throughout the day, I will stick my finger into the custard dish a few times just to get a little taste. Mmmm. 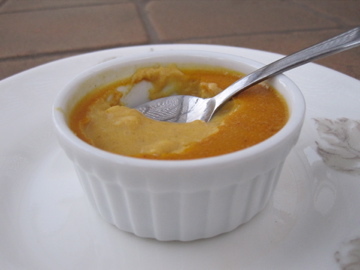 These custards are like the filling of pumpkin pie, but better. I had the intention to make little ginger snaps to go with but never quite got around to it this time. 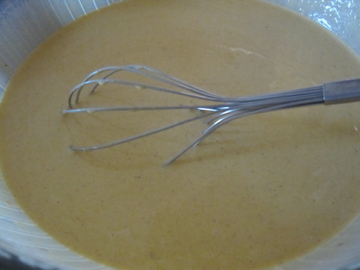 Just mix all of the ingredients together, strain them, and then bake the custard in a water bath until set. 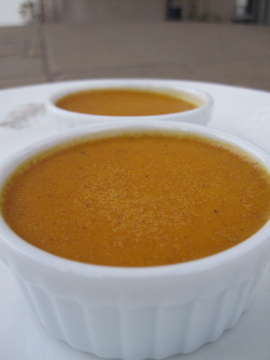 When we make these custards at the restaurant I work at, we use fresh pumpkin (duh, only the best). At home, I was lazy and bought the can. But hey, it was fresh at some point in its pumpkin life…? 1. 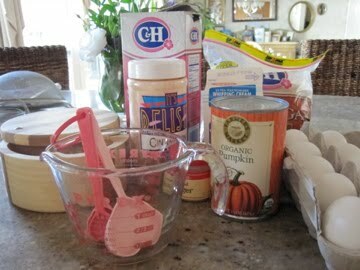 Whisk all of the ingredients together. 2. 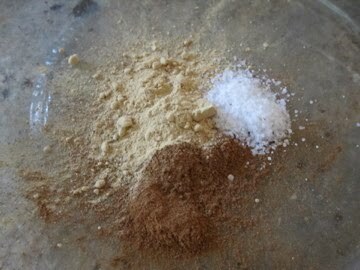 Strain (this is simply for a smooth, even texture and aesthetic reasons). 3. 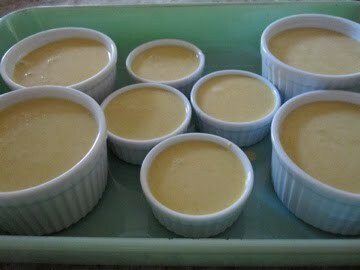 Fill ramekins with custard. 4. Bake in a 275 degree oven in a water bath until set (about an hour, less for the baby ramekins). Rotate at least once during baking. 5. Serve warm, chilled, or room temperature with whipped cream, ginger snaps, or whatever tickles your fancy. >These look delicious!I'm completely addicted to pumpkinEVERYTHING, so these are going rightinto my oven… you have some seriously cute bakeware!